Consumer tablet interest is huge for the holidays, so who are the winners? 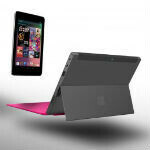 A new survey has come out trying to figure out what tablet people are intending to buy this holiday season, and while some of the information is pretty easy to guess (the Apple iPad is the most popular tablet on the list), there were some surprises when it came to the Microsoft Surface and Google Nexus 7. The biggest surprise was that consumer interest in the Microsoft Surface dropped 53% after the price announcement, but Microsoft's tablet still had more interest than the Nexus 7. The survey was performed by Parks Associates, first to find consumer interest in holiday tech purchases in Q3 of 2012, then again more recently. Not surprisingly, the Apple iPad was the top device with about 44% of consumers intending to purchase an iPad during both sessions of the survey. What is surprising is that in Q3, the Microsoft Surface also had about 44% of consumer interest, then a few things happened: Microsoft announced the price of the Surface, the Google Nexus 7 started gaining attention, and Amazon announced a new line of Kindle Fire tablets. After all of that, interest in the Microsoft Surface dropped to around 21%, just behind the Kindle Fire, which was at 24%. And, the Google Nexus 7, which didn't even register on the Q3 survey, rounded out the Q4 numbers with about 12% of consumer interest. Of course, as with most surveys, we have some questions about the data. First, are all 3 Kindle Fire tablets counted under the same heading? Because there is only one listing there. Similarly, it doesn't seem as though the Google Nexus 10 was part of the survey, and the graph oddly shows the Apple listing as the "iPad 2", but it seems that includes the iPad 4 as well. Then, the big question is: what's the correlation between intent to purchase, and the actual act of purchasing? So far, projections are mixed on the sales of the Microsoft Surface, but given how many retail stores carry the Surface, the sales do not seem to match the survey's results for intent between the Surface and the Nexus 7. The Nexus 7 has been projected to sell 1 million units in December alone, while it's unclear if the Surface will get to that number for the entirety of Q4. It's no surprise that the iPad has the top spot, because for better or worse, it is still seen as the de facto purchase choice for a tablet by most media outlets and casual consumers. The more a consumer knows about the options, the more likely that price and feature set will become a factor, which then skews the choice towards the Nexus line. Of course, the Nexus line also doesn't get the same amount of in-store visibility that other tablets do; and, given that fact, having 12% of consumer interest is actually quite impressive. The survey had other interesting findings like the fact that for the first time, more U.S. broadband households plan to purchase a tablet during the holidays than a laptop, netbook or Ultrabook. This seems reasonable, especially with the rise of inexpensive tablet options like the Nexus 7, Kindle Fire, and iPad mini. In that vein, when the Apple iPad mini was added to the survey, 40% of those who had said they planned to buy an iPad changed their minds and said they would go for the lower cost iPad mini instead. Also, 33% of U.S. broadband households now own a tablet, and that number is expected to double to 66% by 2013. That means a lot of tablet sales over the next couple of weeks. It should be very interesting to see the Q4 earnings calls when they roll around next year. All 4 are available here in Iceland. Where r u from Wendy? Lmfao that was funny and true! dude, you asked that before...are you? Good..who cares. I dont see ipad3, 4 and mini on the chart? Yeah, that graph label was odd, but it seems that both the iPad 2 & 4 are part of that same listing. The survey is from Parks Associates, CNN was just the first major media entity to report on it. The full info behind the survey costs $5,000, so we certainly don't have it. IPad and nexus 7/10 will probably sell the most. Kindle fire will get some decent sales. Im sure win8 tabs will sell, just not the surface. Funny most people still want the iPad 2. I read too many times that MS winning the rumor war. But they alway lose the sales war. is what I say true, if yes then it doesn't matter I hate some1 or not. But frankly I hate monopolies: MS, Apple, Intel you name it. Android is not monopoly b-c it's open source. Any1 can make something else from Android, but can they do the same with Windows or iOS? I guess u r young and don't understand the bad things that monopoly brings. It's business, you bet. but do you know it's bad when some big players come together and agree on prices? That's business too, right? It's in fact called price fixing and if caught those companies can be fined heavily. If you a a monopoly you can raise price almost at will w/o any punishment at all. android is a monopoly. they don't make money on their services but they make money on adds. having a free platform and services is just a strategy to spread their adds everywhere.